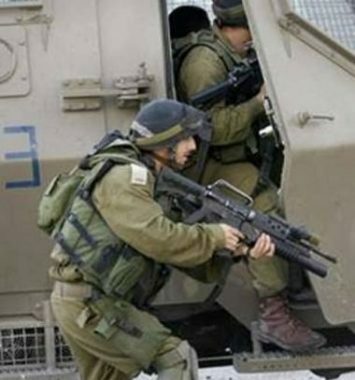 Israeli soldiers abducted, on Sunday at dawn, two Palestinians from their homes in Silwad town, east of the central West Bank city of Ramallah. The army also invaded many areas in Tulkarem and Hebron, searched homes and stole gold. The Palestinian Prisoners’ Society (PPS) said many army jeeps invaded Silwad town, east of Ramallah, before the soldiers broke into homes and searched them, and abducted two Palestinians, identified as No’man Saleh Hamed and Mohammad Abdul-Majid Hamdan. The soldiers also interrogated many Palestinians, especially young men, while inspecting their ID cards. In addition, dozens of soldiers invaded Khallet at-Tawil area, and the main road between the towns of ‘Allar and ‘Atteel, north of the northern West Bank city of Tulkarem, and isolated it before initiating an extensive search campaign. It is worth mentioning that, on Friday, the Palestinian police found several explosive objects, placed on sides a 2-kilometer road, which was paved two months ago through funding from the Palestinian government, and the Local Council in ‘Allar town. In related news, the soldiers invaded at least two homes in Beit Ummar town, north of the southern West Bank city of Hebron, and conducted violent searches, before stealing gold from one home. Local activist Mohammad Awad said the soldiers invaded Mothallath al-‘Ein area, in Beit Ummar, before breaking into the homes of Ahmad Rashid Sabarna and Yousef Ahmad Sabarna, and stole a gold necklace, a gold chain and a ring, owned by Ahmad’s wife, Lobna Nabil Abu ‘Ayyash. Also at dawn, the soldiers abducted three Palestinians and injured a child, during extensive and violent searches of homes, in the town of al-‘Isawiya, in occupied East Jerusalem, after the army isolated it since Saturday evening.